So, as promised, we’re going to start bringing out a recipe a month to bribe *ahem* encourage folks to dust off their books and actually cook something! I want to see what you’re doing and if it means sweetening the pot a little bit, then so be it! Our first recipe up for the challenge: White Chicken Chili from Chapter 2. Right now where we are it’s cold and drizzly. Other parts of the country are still snowy and frozen. A quick, warming soup like this week’s recipe is just the ticket. Now, a tip about what sort of chicken to use. You can certainly start with fresh chicken breasts, season them and cook them ahead of time. You can also use thighs if you want a little more flavor or you can use pre-cooked chicken from the ready-made section of your local grocery store. This is also a fabulous vehicle to use up leftover rotisserie or roast chicken, either homemade or from the deli. In that case you just want to break it up into bite-size pieces or shred it. Either way you’re golden. Here’s the deal. If you prepare the White Chicken Chili between now and the next recipe challenge announcement AND post your picture or link in the White Chicken Chili forum thread on or before March 21st, instead of earning the usual 275 XP, you’ll received 375 XP! That’s right, an extra 100 points just for being awesome and participating. And if you don’t have your copy of What to Feed Your Raiding Party yet, well, then, head over to the shop page and order it! It should get to you within a week and you’ll still have plenty of time to join this month’s fun! In addition to ALTCon on April 13, I’ll also be at North Florida Comic Con in Jacksonville on April 28th. It’s my birthday weekend so I’m really hoping for a good show! 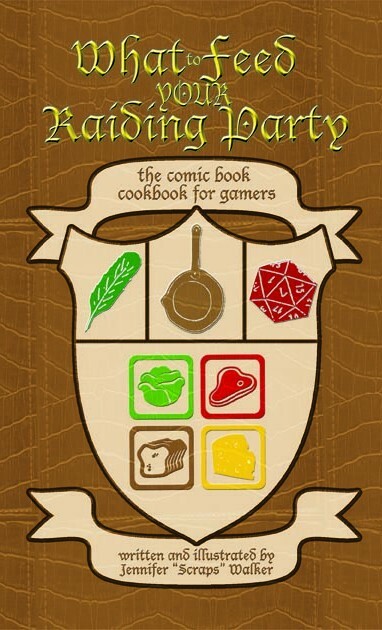 The comic book cookbook that challenges gamers to cook their way out of the fast food dungeon.